“In 1836, Anna Jameson sailed from London, England, to join her husband in Upper Canada, where he was serving as attorney general. Shaking off the mud of Muddy York with mild disdain, young Mrs. Jameson swiftly sallied forth to discover the New World for herself. 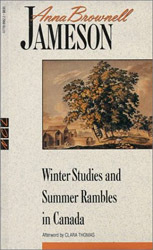 The best known of all nineteenth century Canadian travel books, Winter Studies and Summer Rambles in Canada is Jameson’s wonderfully entertaining account of her adventures, ranging from gleeful observations about the pretensions of high society in the colonies to a “wild expedition” she took by canoe into Indian country. I’ve only just started this one, but one interesting thing is that Jameson’s husband is such a prominent figure in I’ve Got a Home in Glory Land, which I’ve just read. This book took a very long time to read but in fact I did finish it back in May(!) It’s now November! The format of this book is very unusual—perhaps unique. In 1836 Jameson travelled to Toronto just before winter set in, and of course in the days before central heating, there wasn’t much to do in the long Canadian winter, but hunker down and read. The first part of her book is like, well, like a book blog, detailing her reading and her thoughts about Goethe (whom she had personally met). I enjoyed the intermittent descriptions of her life in Toronto (& would have loved for her to give us more), but I’m afraid I couldn’t fully appreciate her literary analysis because I haven’t read anything by any of the authors she mentioned. After the long cabin fever, Jameson was ready to go out & explore, and the second half of the book is a travel memoir. Despite advice to stay in what passed for civilisation (she was deeply homesick for the cultured salons of Europe), she decided to embark by herself on a remarkable trip into what was then the deep interior of the country. First, she journeyed down through the settled areas along Lake Erie’s northern shore and then by bateau and canoe north, traversing Lake Huron to Michilimackinack and Manatoulin islands (where she attended the annual gathering of First Nations of the area), and then south through Georgian Bay and Lake Simcoe, and finally travelling overland down Yonge Street back to Toronto. She describes the people (settlers & First Nations) in great detail, tells anecdotes, relates First Nations folk tales, discusses the Chippewa (i.e. Ojibwa) language & customs, and depicts her experience of the landscape with a wonderfully observant eye. I absolutely loved this book. What a treasure Anna Brownell Jameson has left us! As long as it was, I wished it would go on for another 300 pages. You are currently browsing the Reader of the Stack weblog archives for February, 2008.